A visual looking at Anna Karenina from written text to visual tarot language and “the gospel in a brief” from text to intuitive analisys: featuring Russian Tarot of St. Petersburg by Youri Shakov, Golden Tarot of The Tzar by A. Atanassov, Byzantine Tarot by Jown Matthews and Cilla Conway and Russian Gypsy Fortune Telling Cards by Svetlana A. Touchkoff. 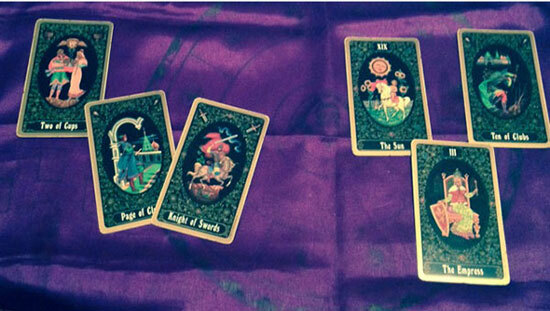 Written words are a type of language and Tarot visual images are another. They can substitute and also complete each other. 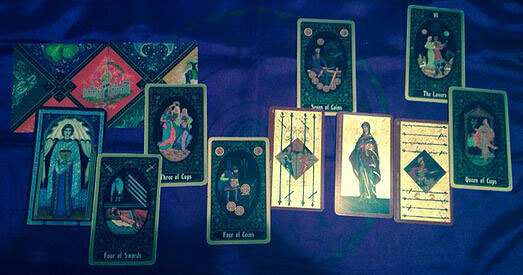 Tarot spreads in storytelling can be made outward (from text to chosen cards in any spread) or inward (from intuitive spread with cards taken by chance to get the analysis of the characters, plot and so on). 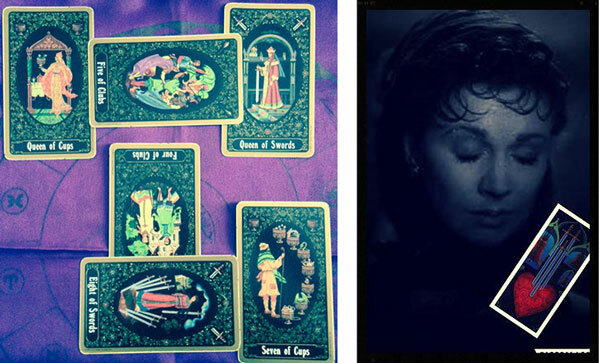 In this short essay I am going to use the summary of the novel “Anna Karenina” to show how a written text can be converted into a visual text using a few tarot spreads with previously chosen cards. 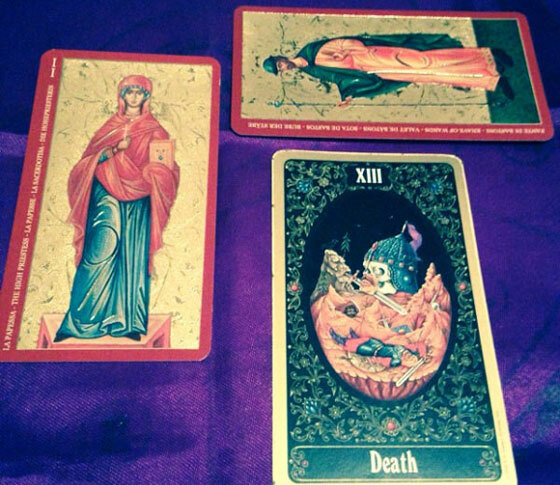 In the sequence I am going to analyze, through an intuitive tarot spread and cards taken my chance, the meanings behind the main idea in the “The Gospel in a Brief” novella. The choice of the decks for this essay was obvious their approach to the Russian Culture. 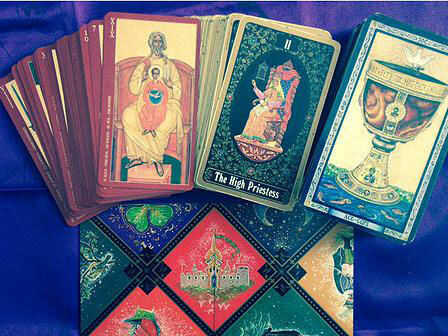 The Byzantine Tarot, representing the heart of Eastern Orthodoxy, comes along with historical characters and circumstances which are archetypes for human beings everywhere in any time. 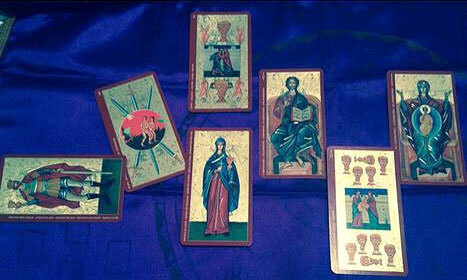 The golden Tarot of The Tsar, also representing the orthodox side of the church, comes along with bible figures which are also universal. 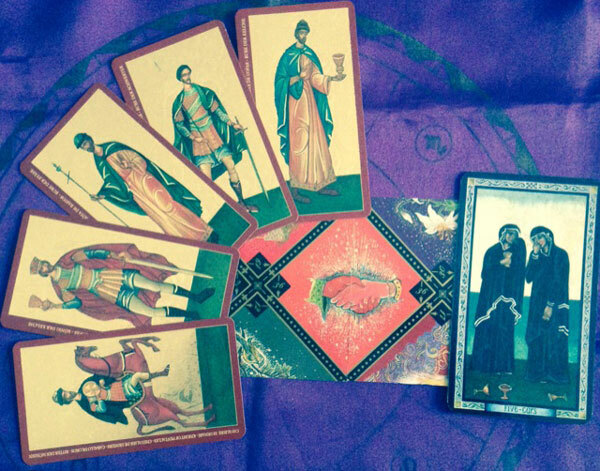 The Russian Tarot of St. Petersburg comes along with a RWS approach based on The Russian Folklore and Tradition. 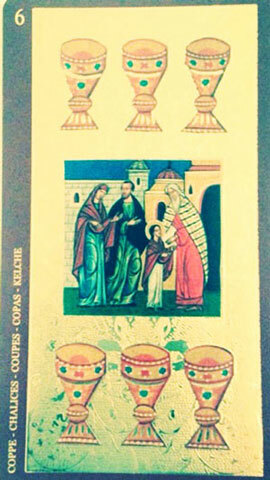 And The Russian Gypsy Fortune Telling Cards have a little bit approach to the traditional Lenormand once it holds its same designs but adding a few more spice with cards like the Crayfish, the Angel, the Horseshoe, the Knot, the Handshake among others in a total of fifty figures meanwhile the Lenormand holds only thirty six cards. 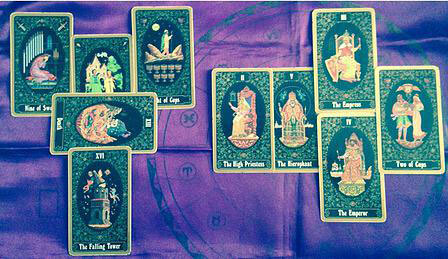 The conversion of the written text to a visual text using tarot cards can be made with any text, any tarot deck and any layout. This exercise has no rules and people's imagination might guide them to choose the best card to represent a specifc energy in the plot. Just remember that using a deck with a cultural approach to the subject is always more effective. 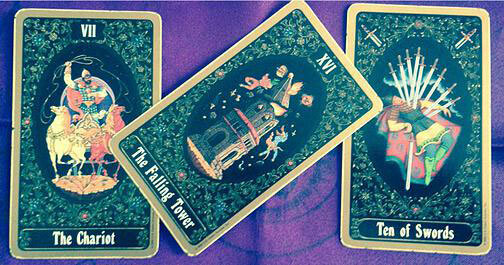 the Four of Clubs is cut by the Death and ruined by the Tower. 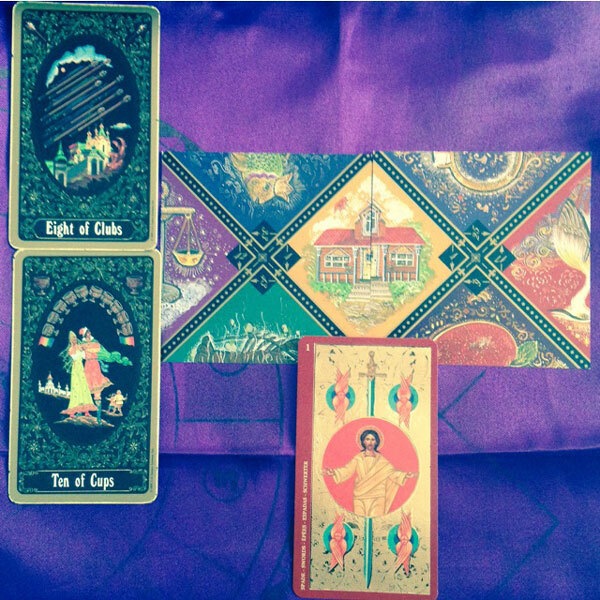 of the Two of cups. Marriage is saved. of Adam and Eve thrown out of Eden. The paradise was denied to Levin and to Kitty. Vronsky, however, follows Anna to St. Petersburg, and their mutual attraction intensifies as Anna begins to mix with the freethinking social set of Vronsky’s cousin Betsy Tverskaya. At a party, Anna implores Vronsky to ask Kitty’s forgiveness; in response, he tells Anna that he loves her. Karenina goes home from the party alone, sensing that something is amiss. He speaks to Anna later that night about his suspicions regarding her and Vronsky, but she curtly dismisses his concerns. represented by The Lovers. 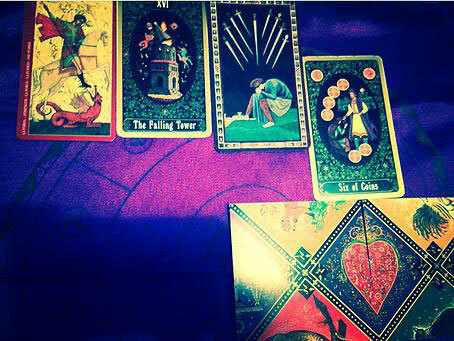 Anna denies all with the energy of the Seven of Swords above her head. Sometime later, Vronsky participates in a military officers’ horse race. Though an accomplished horseman, he makes an error during the race, inadvertently breaking his horse’s back. Karenina notices his wife’s intense interest in Vronsky during the race. He confronts Anna afterward, and she candidly admits to Karenina that she is having an affair and that she loves Vronsky. Karenina is stunned. 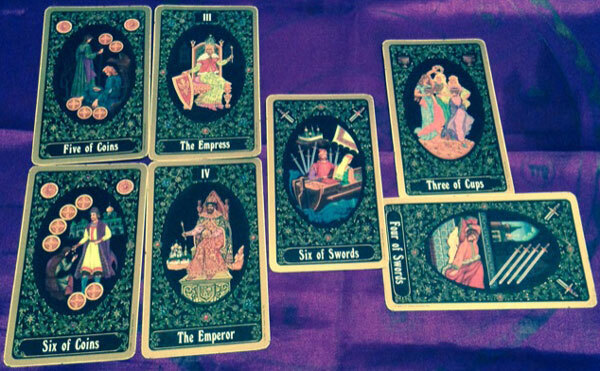 the energy of the Six of Coins and she confesses her affair through the Heart energy. Kitty, meanwhile, attempts to recover her health at a spa in Germany, where she meets a pious Russian woman and her do-gooder protÃ©gÃ©e, Varenka. Kitty also meets Levin’s sickly brother Nikolai, who is also recovering at the spa. Levin’s intellectual half-brother, Sergei Koznyshev, visits Levin in the country and criticizes him for quitting his post on the local administrative council. Levin explains that he resigned because he found the work bureaucratic and useless. Levin works enthusiastically with the peasants on his estate but is frustrated by their resistance to agricultural innovations. He visits Dolly, who tempts him with talk of reviving a relationship with Kitty. Later, Levin meets Kitty at a dinner party at the Oblonsky household, and the two feel their mutual love. They become engaged and marry. Karenina rejects Anna’s request for a divorce. He insists that they maintain outward appearances by staying together. Anna moves to the family’s country home, however, away from her husband. She encounters Vronsky often, but their relationship becomes clouded after Anna reveals she is pregnant. Vronsky considers resigning his military post, but his old ambitions prevent him. Karenina, catching Vronsky at the Karenina country home one day, finally agrees to divorce. Anna, in her childbirth agony, begs for Karenin’s forgiveness, and he suddenly grants it. He leaves the divorce decision in her hands, but she resents his generosity and does not ask for a divorce. Instead, Anna and Vronsky go to Italy, where they lead an aimless existence. Eventually, the two return to Russia, where Anna is spurned by society, which considers her adultery disgraceful. Anna and Vronsky withdraw into seclusion, though Anna dares a birthday visit to her young son at Karenin’s home. She begins to feel great jealousy for Vronsky, resenting the fact that he is free to participate in society while she is housebound and scorned. In this layout Anna begs Karenina to forgive her (Five of Coins). He forgives her (Six of Coins). 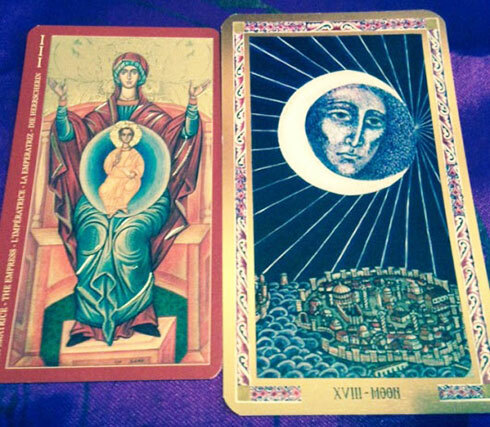 of the Six of Coins is the charity card and that is exactly the energy of Karenina towards Anna. flirt with Kitty. And Levin, now assuming the energy of the Knight of Swords asks him to leave. dependent on sedatives and still waiting for her divorce (Ten of Wands). Levin and Kitty move to Moscow to await the birth of their baby, and they are astonished at the expenses of city life. Levin makes a trip to the provinces to take part in important local elections, in which the vote brings a victory for the young liberals. One day, Stiva takes Levin to visit Anna, whom Levin has never met. Anna enchants Levin, but her success in pleasing Levin only fuels her resentment toward Vronsky. She grows paranoid that Vronsky no longer loves her. Meanwhile, Kitty enters labor and bears a son. Levin is confused by the conflicting emotions he feels toward the infant. Stiva goes to St. Petersburg to seek a cushy job and to beg Karenina to grant Anna the divorce he once promised her. Karenin, following the advice of a questionable French psychic, refuses. somehow intensifies Anna’s disgrace in the narrative. Her own judgement is on the way. Anna picks a quarrel with Vronsky, accusing him of putting his mother before her and unfairly postponing plans to go to the country. Vronsky tries to be accommodating, but Anna remains angry. When Vronsky leaves on an errand, Anna is tormented. She sends him a telegram urgently calling him home, followed by a profusely apologetic note. In desperation, Anna drives to Dolly’s to say goodbye, and then returns home. She resolves to meet Vronsky at the train station after his errand, and she rides to the station in a stupor. 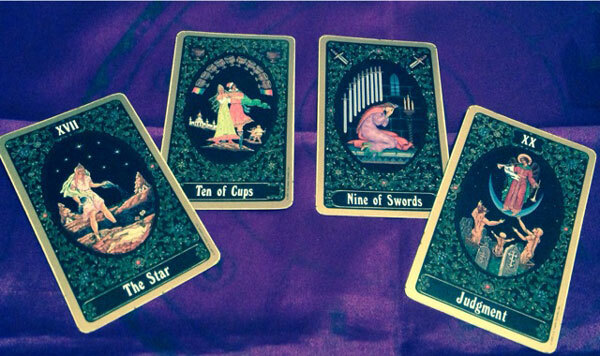 cannot see the reality and locks herself by her own will, into the energy Seven of Cups. At the station, despairing and dazed by the crowds, Anna throws herself under a train and dies. In this layout we see the male characters supporting the Russian Cause represented by the Handshake for Slavic peoples attempting to free themselves from Turkish rule represented by the Five of Cups. Kitty becomes worried by Levin’s gloomy mood. He has become immersed in questions about the meaning of life but feels unable to answer them. One day, however, a peasant remarks to Levin that the point of life is not to fill one’s belly but to serve God and goodness. Levin receives this advice as gospel, and his life is suddenly transformed by faith. Later that day, Levin, Dolly, and Dolly’s children seek shelter from a sudden, violent thunderstorm, only to discover that Kitty and Levin’s young son are still outside. Levin runs to the woods and sees a huge oak felled by lightning. He fears the worst, but his wife and child are safe. For the first time, Levin feels real love for his son, and Kitty is pleased. Levin reflects again that the meaning of his life lies in the good that he can put into it. (Eight of Clubs) just on the top of their heads. But his House, wife and kids are safe. Levin conquered his faith through the glory of the savior represented by the Ace of Swords. Only the spirit - the son and the father - truly exists. The term "Son, Father & Holy Spirit" by all means is related to the TRINE principle of the Sacred Geometry: As Above So Below. Life upon the Earth follows the same principle of the stars. It begins (Father) develops (Son) and Ends (Holy Spirit). Tolstoy in his "Gospel in a Brief" recaps the four gospels in a more human approach and considers the spirit as the synthesis of the beginning and development of the human life. His quest in this novella is to explain the eternal present as if these three forces (creation, development and end) could be represented in a space where time is no longer important. And the bread - the word - he stretch forth his readers, is the path to understand his so sophisticated theory. In this layout “The Bread” the word. Russian Gypsy Fortune Telling Cards. In the preface of his Gospel Tolstoy says: "The teachings of a great man can only be considered great if he clearly and understandably expresses that which others have only expressed unclearly and incomprehensibly." And goes far: "The teaching of a great man is only great insofar as it unifies people in a single truth for all." when they are presenting young Mary (Mother of Jesus) to the temple. So, in Tolstoy's theory about the eternal present we can view a space where time gets no influence on. But in practice how that could work? 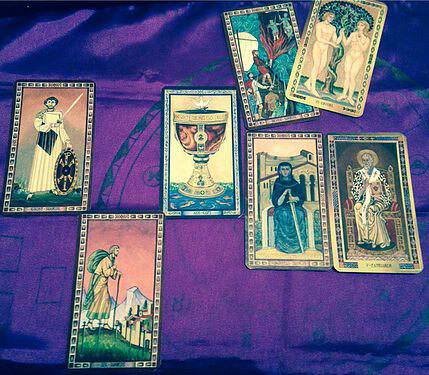 The answer is the Six of Chalices. The eternal present can be achieved through our thoughts. Through our thoughts we can reach past, present and future at once. We can reach deep feelings, materialize realities. Through our thoughts we can achieve inner peace and heaven. Our mind is our inner God. All the secrets of the Universe are inside us. And through our thoughts we can reach them all. Only inside us we can reach Tolstoy's eternal present. And then all can be possible!